"The Golden Rule also reminds us of our responsibility to protect and defend human life at every stage of its development. This conviction has led me, from the beginning of my ministry, to advocate at different levels for the global abolition of the death penalty." 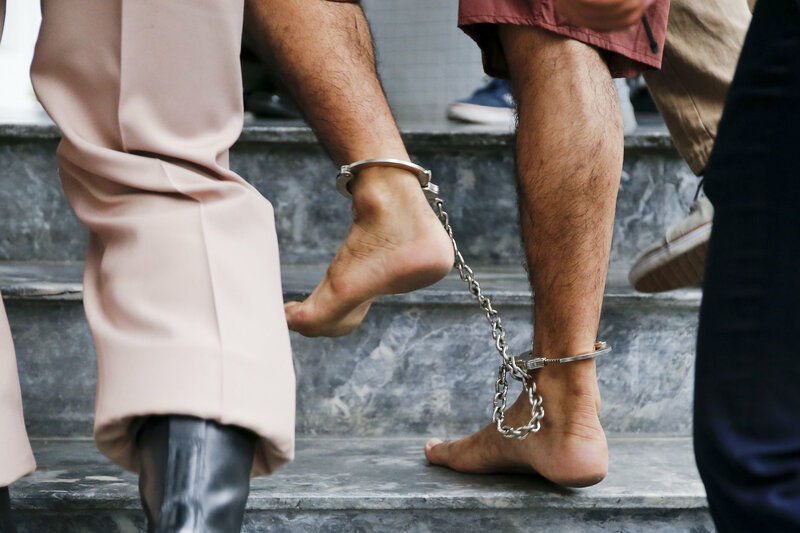 The shackled feet of a bombing suspect in Bangkok, Thailand, are seen as he is escorted by officers and prison personnel to Military Court Feb. 16. Pope Francis asks world leaders for a Jubilee Year moratorium on the death penalty. (CNS photo/Diego Azubel, EPA) See POPE-ANGELUS-DEATH-PENALTY Feb. 22, 2016. The adage “a chain is only as strong as its weakest link” comes to mind when considering the effects of criminal behavior and society’s response to it. The common good is undermined by criminal behavior that threatens the lives and dignity of others and by policies that give up on those who have broken the law. We are called to show compassion and mercy to all, including those who are incarcerated. Our individual humanity is strengthened or weakened by how we, as a society, treat those who most need merciful justice. Like all affronts to the dignity of life, the death penalty diminishes humanity. Church teaching on the life and dignity of every human person should guide all our decisions about life, including the use of the death penalty. Furthermore, research shows that we cannot reduce crime by executing criminals and simple logic tells us the lives of the innocent are not restored by ending the lives of those convicted of their murders. We are called to reflect on what the Lord’s command, “You shall not kill” (Ex 20:13) means for us today. It is clear, as the Church has refined her teaching on this issue, that the current criminal justice system has both the tools for life imprisonment without execution and has significant flaws in sentencing practices that undermine the ability for the public to trust that every convicted person on death row in Texas is actually guilty. A capitol jury has a tremendous burden of determining whether an inmate lives or dies. Jurors carry the weight of this decision and its impact for the rest of their lives. In the upcoming legislative session, we have the opportunity to improve the rights of jurors serving in death penalty sentencing cases. Texas law is intentionally misleading as it requires judges and attorneys to lie to jurors about the level of unanimity required for a death sentence. The Texas bishops will be supporting efforts to revise capital jury sentencing instructions to prevent this concealment of juror's individual capacity to impose a sentence less than death. While we will continue our efforts to end the use of the death penalty in Texas, this legislation will at least improve the fairness of the current system. Learn more about the death penalty and Catholic teaching applicable to this issue. Contact your Texas legislators and ask them to revise the law about capital jury sentencing instructions so that judges and attorneys are not forced to lie to jurors about the level of unanimity required for a death sentence.